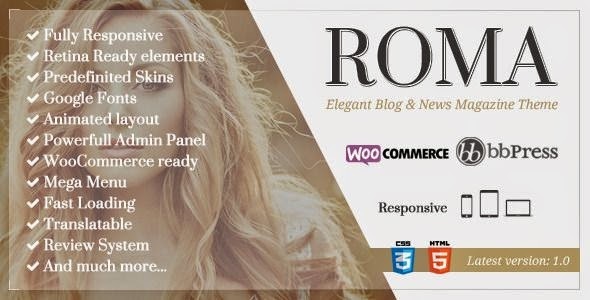 ROMA is an Elegant Blog & News Magazine Theme Concept for any kind of creative or business use. Built upon the responsive Twitter Bootstrap framework, the theme is highly optimized for both mobile and desktop platforms. Animate CSS give awesome look-and-feel loading and page scrolling effects. With SEO and FAST LOADING in mind, it's optimized all codes. With ROMA you can setup your Blog and Magazine Website in about 5 minutes with Powerful Options Panel built on The best Redux Framework. Item Reviewed: Fresh and Elegant Blog News Magazine WordPress Theme 2015 9 out of 10 based on 10 ratings. 9 user reviews.